Slept very well last night… The first of my priorities this past summer of freedom was working on my music, which I may try and cover later. The second was to ride my vintage 1991 Sequoia Touring Bike all the way from Seattle to Iowa to see my grandmother. I’d been contemplating an adventure like this off and on for some ten years, but never managed to get it on the schedule. Now that I’m in my mid-forties, however, I decided I have to tackle this while I am still sane and able-bodied. And grandma is not getting any younger, either! Her ninety-fifth birthday is the eleventh of next month, and I’m going to try and be there for the party. The bike, loaded down with clothes, a tent, a sleeping bag and all kinds of special tools, is worryingly heavy. Though built for extended touring, I’m concerned that the weight will lead to numerous flat tires. (In fact I got one just a couple blocks from my apartment when doing my first full load test ride a few weeks ago.) I probably could have scrimped and left some items behind, but cycling halfway across America is an endeavor that demands to be taken seriously. Freedom is the ability to depart without having to return. I am not on a trip, I am on a journey. A transition, if you like. Yet I almost didn’t make it out of the Seattle area. The Burke-Gilman Trail, which snakes through and around the university, was a pleasant enough ride, but the maze of special east side bike trails afterwards had me on my way to Redmond at one point rather than Monroe. Kind of like a misguided rocket falling back to earth. The freeway rules regarding bikes and a hard-to-decipher map further confused things. But fortunately there was plenty of time to get re-oriented and back on track. The Monroe Hotel I’m staying at is next to a pleasing little brook and is delightfully quiet and out of the way. As I write this entry, a train is coming through the early evening. Its wail is long and lonely with an undercurrent of clicks and clacks, all of which would get bleached out in the never-ending rumble of the megalopolis I left today. My old Seattle life is already beginning to recede. The rain that had been threatening off and on never came to pass. While the Seattle TV weathermen cannot mention precipitation without adding the adjective “much needed”, I’ve always felt that there’s a proper time and place for it, say October through April, or anytime I’m not out riding. I hope the amiable conditions will continue. Then again, I’d rather cycle through a chilly drizzle than have the late summer sun bake me onto the asphalt. Especially with the Cascade Mountains looming on the horizon. Their size and beauty makes a crossing attempt seem puny, almost insulting. How dare I? Ready to shove off, dorky glasses, short hair and all! It was a fairly short ride to Skykomish, which is strategically located just sixteen miles west of Steven’s Pass up in the Cascades. Good thing as my stomach as been acting up, most likely from a combination of shifting eating schedules and spicy foods. Not really painful, but the damn thing bloats, making me look like a Budweiser U. Alumni. I could probably make some good advertising money by painting “Goodyear” on it and showing up at a football game. The tummy troubles make today’s meager mileage quite satisfactory. The last eight miles, in fact, saw me actually step up the pace, arriving some twenty minutes earlier than planned. 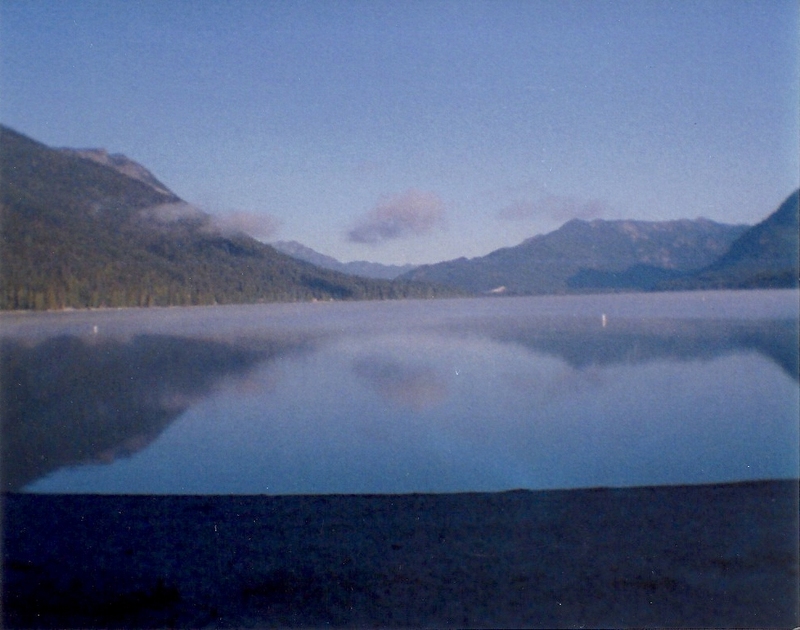 Which brings us to the hamlet of Skykomish. Or at least the buildings. I rode down Main Street and didn’t see a soul. Like something out of a Stephen King novel. The steakhouse, for example, has a “For Rent” sign hanging from a window. Inside the tables are still covered with tablecloths and silverware. It’s like the owners suddenly closed up just before the evening crowd began arriving. Or perhaps that was when the vampires started attacking? Probably best not to openly speculate until I’m safely away tomorrow. The Sky River Inn where I am spending the night is on the main road, which sees plenty of urban hikers and skiers passing through, so the prices have gotten “Seattleized”. Not that I had any options. Trying to extend and go over a mountain pass on only the second day, before I’ve built up any endurance, is just begging for an injury. This place, by the way, is one of the hotels which my Korean girlfriend and I stopped at back in 1996, a half-dozen years ago. That was truly an educational summer. We’d met in Taejon, South Korea where she was a student in one of the English classes I taught. Once I was finished with that experience and returned to Seattle, we decided she would come join me in the U.S. for a kind of goodbye fling. It was intended to be a month of romantic and exciting adventures as I showed her around my native land. And by the time I saw her off at SeaTac Airport in late August, I was crying — tears of joy at finally getting rid of her. If you ever want to really get to know someone, take them to a country in which they have a minimal interest, speak hardly any of the language, and, to top things off, dislike the food. My Korean lover was transformed from an exotic, exciting woman with a sense of humor and a bit of an edge to an impatient, easy-to-anger vixen who nevertheless wanted to spend every last minute with me. Not that I was without blame, suffering through reverse culture shock and experiencing considerable angst attempting to decide on what I wanted to do next with my life. It’s fair to say neither of us were in very agreeable moods most of the time. Therefore, re-visiting a hotel from that acrimonious summer is a bit like touring a Civil War Battlefield. I seem to recall that the “Skirmish at the Sky River Inn”, as I now like to refer to it, stemmed from my desire to just grab some sandwiches and snacks for dinner rather than going out to a restaurant, which was what she wanted to do. We probably should have given that spooky steakhouse some business, but I doubt she would have enjoyed the meal. Funny thing, though. As I now reminisce about all those squabbles, I find myself missing my old girlfriend’s quick smile. The six years since that bruising month together have been agreeable enough, with my restarted IT career, but also strangely empty. I suspect there is a part of me which craves a major challenge, whether it’s getting along with an impatient Asian lover, or cycling up a mountain pass. 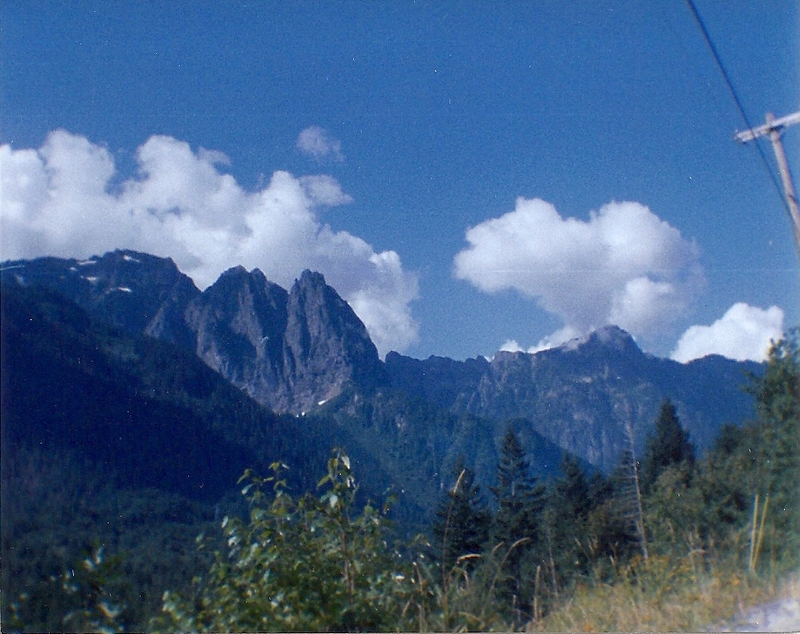 It took me around three hours, including rest stops, to reach Steven’s Pass from my starting point outside Skykomish. The first half of the sixteen mile climb wasn’t too tough; it’s the second part that tries to do you in. So many long stretches of inclines that level ground begins to seem like a novelty. I managed to survive the ordeal by basically plodding along, counting my pedal revolutions and when I neared a certain threshold, began looking for a place to pull over and take a short break. The spectacular panoramic views of steep, forested slopes made these rather enjoyable. Reaching the top gave me a sense of accomplishment I had not felt in years. Certainly the weekly meetings of the IT group I’d worked in had never left me in such elated spirits. I took my lunch by the closed-for-the-season ski lodge and listened to music someone working nearby was playing: The Who, John Cougar, and my all-time favorites, The Beatles. Like that tune off of the Sgt. Peppers album, I truly felt on this fine, sunny day that I was “in the sky with diamonds”. After finishing my scenic summit meal, the next couple of hours were a biking free-fall with minimal peddling required. I only had to be careful that I didn’t build up too much momentum and end up flying off the road and into some tree. The near-constant attention this required prevented me from taking in much of the scenery that rushed by. Restaurant Note to Myself: Anytime the menu says “big” or “hearty”, order a la carte, regardless of how ravenous you may feel. I believe my breakfast of this morning must have cost the lives of two large potatoes. I had trouble even finding the scrambled eggs, buried as they were beneath the spud avalanche. This made for sluggish going for the first part of the climb as my body tried to balance digestion with exercise. Tonight I have decided to skip the hotel scene and camp out. According to my map, the nearest accommodation is close to fifty miles away, albeit downhill. A bit too much after the day I’ve put in. Also, I’m feeling a tad guilty about lugging my tent and sleeping bag along and not putting them to use yet. I received a bit of rain while making camp, which motivated me to a new, set-up-the-tent record of fifteen minutes. Tonight there’s a stiff breeze coming off the lake onto the beach where I’m relaxing and doing my writing. I take it as a good omen. I’m nice and cozy — the tent is zipped down and the sleeping bag zipped up. It’s now me versus the great outdoors. A one night engagement. The breaking waves from the lake will serve as a soothing soundtrack. A good time to talk about my music! Somehow, the idea of recording a number of my songs, many of which I wrote way back in college, snuck onto the task list back in mid-June after I had wrapped up my short-term contract at work a month early. With the unexpected free time — and an apartment I could freely play and sing in without anyone complaining — I realized this would be a rare opportunity to finally get my musical efforts onto tape. The month of July was used to work on the five unfinished piano tunes. I had purchased a small four track recorder which I used to layer multiple vocals on top of the instrument. (Just like the Beatles, except without the talent.) It required a lot of tedious repetition to get acceptable results, but I found it rewarding overall. Likewise, August saw me scrambling to wrap up the guitar compositions. A tough challenge; I’m not sure for example that I always had the damn thing properly in tune with the piano for the couple of songs that required both instruments. Once everything was recorded, it was time to mix the tracks onto a single cassette. This turned out to be a real headache at times, tweaking first the level of the instruments, then the vocals. Back and forth. During the final week leading up to my glorious departure for this trip, I was putting in eight and nine hour days on this while at the same time packing up my apartment. At least the story had a happy ending: the songs all ended up sounding pretty good. At least to my untrained ear. Almost all of them had been circulating in my brain’s creative department for over two decades and I’m happy I finally found the time and motivation to clear them out. It made the summer extra special. Started off the day wearing the ski gloves I’d brought along to keep my hands warm on chilly mornings. By mid-afternoon I was applying suntan lotion. Late afternoon had me checking into a graceful century-old hotel in a lonely high plains town, just ahead of a rain squall. If the goal of this trip was variety, then I can stop right now. It took almost an hour and a half to pack up camp this morning. Not sure why. Folding a small tent and its cover isn’t exactly rocket science. Good thing there was a restaurant not far down the road as I was running late. For the second day in a row I had a full breakfast, but this time it wasn’t smothered in potatoes. While shoveling in the food, I was treated to John Lennon’s “Jealous Guy”. Nice to know the (ex) Beatles are still with me. The first stage of the ride was a long and winding downhill coast as I descended the east slopes of the Cascades into the Bavarian community of Leavenworth. Plenty of tourists ambling about, which gave the town somewhat of a festive air which I took in while relaxing for awhile in a park. Riding out of Leavenworth, the road straightened and leveled off and I got into a nice cycling groove. I resumed this after lunch in Lincoln Rock State Park as I turned north, following the Columbia River up to Orondo. At that point, I was only some eight miles from my destination for the day. What could possibly go wrong? If there is a cycling hell, it must surely include the stretch of Highway 2 east of Orondo: over five miles of constant five to six degree inclines as the road tortuously climbs up through a canyon. Worse yet, the inclines had countless false endings. I’d pedal up towards the end of a long curve expecting to be near the top only to encounter a new stretch of ascending punishment. I knew I should have gone to church last Sunday. If given the choice, I’d rather do Steven’s Pass a second time instead of today’s death ride. The highway to the pass is a bit steeper, but at least it doesn’t tease you. By contrast, there were times during today’s relentless grind when I swore I could hear the asphalt chuckling. Reaching the long-anticipated top, I felt I was in some kind of reverse “Wizard of Oz” scenario. What greenery there was had been gradually disappearing the entire day, leaving me in what looked like Kansas. All around were plowed brown fields with occasional patches of yellowed wheat. Soon thereafter I caught sight of my destination: the rustic community of Waterville, which is the highest incorporated town in the state of Washington — a fact I could have easily gone without knowing. I counted myself very lucky that the village had a hotel. Given its size and remote location, it’s a wonder there’s even a grocery store. The hotel owner, who’s up to his elbows doing restoration work on the place, gave me a cozy, tiny room and helped store my bike. I feel like I’ve gone back in time here — the guy has done a superb job of re-capturing the past. The bedrooms, for example, have no TV, just restored antique radios dating from sixty to seventy years ago (according to the owner). And while I have a sink in my room, the toilet is down the hall, past old photographs and other snug bedrooms, which make the atmosphere more intimate and welcoming. Almost like staying in someone’s house. It helps a person understand how people got by in the old days without all the snazzy accommodations hotels now offer. Time for one more trip to the ancient bathroom of yesteryear. If I run into anyone, I may ask what they think of President Roosevelt and whether we should stay out of that European war which is brewing. Then, I shall sleep for the rest of the month. Postscript: Just prior to hitting the hay, I tried the old-fashioned radio and instead of hearing Glenn Miller, was treated to Paul McCartney’s “Jet”. Now there’s a song that would have had a 1920s wheat buyer, passing through on his way to Spokane, probably covering his ears! A day where I extended big time. The original plan was to go forty miles to a place called Coulee City south of the great dam on the Columbia River. But after arriving there, and enjoying a hamburger and chocolate shake lunch at a run-of-the-mill eatery, I found I still had plenty of gas in the tank, so I added a solid afternoon of cycling that has placed me within a day’s ride of good old Spokaloo (Spokane). My ambition knowing no bounds, I even managed to tackle the laundry after locating a hotel in what is another dry, Eastern Washington village. The manager was thoughtful enough to provide the detergent. Can’t beat hospitality! Hard to believe I went so far on what is still the first week of my journey. This was one of those shut-up-and-cycle days. It started off by my going a mile in the wrong direction. After leaving the hotel in Wilbur, I messed up the first turn of the day by going right instead of left and didn’t notice my mistake until I was halfway out of town. This did not put me in the best of moods. But after a few choice expletives I calmed myself down, backtracked and eventually was out amongst the rolling hills to the east, each one a bit higher than the last. After a half hour of vigorous climbing, I could still look back and see Wilbur in the distance. Discouraging. But perhaps this was divine punishment for my misguided beginning. To add to this purgatory, a relentless south wind blew across my path the entire morning. As the road turned to the southeast, it became a kind of diagonal drag on my progress. I soldiered on, knowing that mentally I wasn’t at my best. I even got careless with my eating, neglecting lunch until after 1:00 p.m. and almost falling asleep during the meal. My body’s way of telling me I was pushing the proverbial envelope. I reached Spokane by late afternoon. An unexpected benefit entering the city was the long downhill road leading from the airport into downtown. The biking challenges soon shifted from tackling rolling terrain and battling stubborn winds to traffic navigation while keeping an eye out for broken glass on the pavement. The central part of the town held no fascination for me, so I headed north on good old State Highway #2 that I’d been following the last two days out of Orondo. Four miles later, after passing numerous malls, restaurants and car dealerships, I hit the cheap hotel zone. The place I chose to crash at is just across the highway from the “new and improved” K-Mart. My eating out options include an Arby’s, an A & W and a Taco Bell. American Culture: Love it or eat it. After almost a week on the road, it was time to do some obligatory calls to the family. It turns out one of my brother’s step-daughters lives here in Spokane with her father. She and I are going to meet for lunch tomorrow, which will be an R & R day for me. My first vacation of this trip! Spent the morning stocking up on needed supplies such as vitamins, skin moisturizer, and that weird green paper which fits so well into my wallet, then mysteriously disappears. After that I found a nearby spacious park to take in the perfect September weather. When I awoke (to a surprise call from the parents), my old adversary, Mr Migraine, had settled in for a visit. It takes a combination of at least two triggers (out of the four or five I know of) to cause an occurrence. One is accumulated stress, something I’ve had in abundance this past week. Yes, I’m having possibly the experience of a lifetime, but it has been replete with grueling challenges. Another likely culprit is my lazy diet — those D.Q. hamburgers are probably not the ideal food for cross-country cycling. In any event, the more severe migraines can last almost twenty four hours due to the long fade-out. I can function throughout it all, but at the height of the throbbing (usually somewhere in the middle of the grand event) have precious little ambition for anything even remotely strenuous. All I can do is take something with ibuprofen (such as Advil) to try and soften the blow. Rarely do I knock it out completely. Such was the case here. I found myself feeling a bit depressed later in the afternoon. Besides the monster headache, the hotel was definitely on the crummy side, plus the next day I had to go “back to work”. Today: None — Rest Day.